← Do Lightweight Aluminum Pulleys FREE Horsepower? 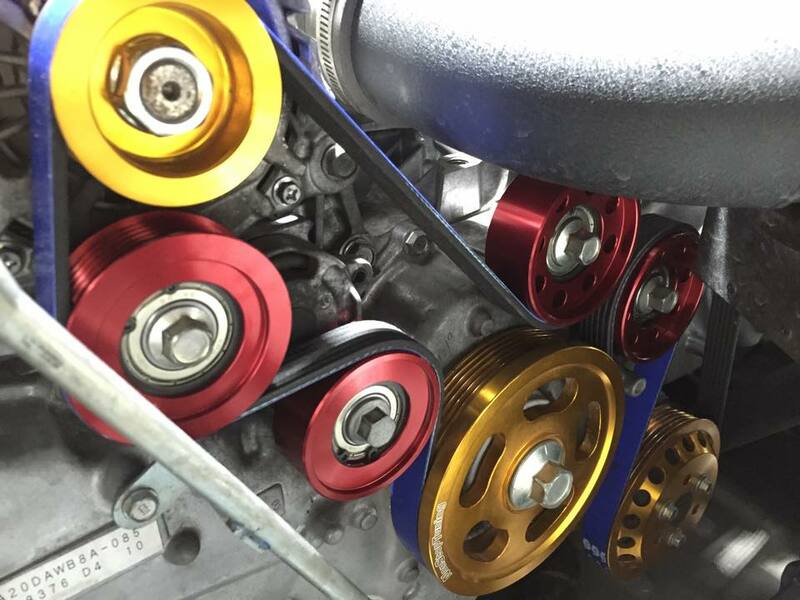 NonStopTuning offers more lightweight pulleys for the FA20 powered Scion FRS, Subaru BRZ, and Toyota GT86, than any other brand! Approximately 70% lighter than the OEM pulleys they replace, NST pulleys provide better overall throttle response, quicker acceleration, and DYNO proven horsepower and torque gains. The NST Lite series is a designation used for pulleys that are light-weight versions of their OEM counterparts. All NST pulleys are built using High quality 6061-T6 aircraft aluminum and are easily 60% to 70% lighter than steel or cast iron OEM pulleys. The NST Lite series is designed for owners looking to reduce weight and increase the throttle response of their engines. These OEM-diameter pulleys will neither underdrive nor overdrive the associated accessories, yet lead to great throttle response and improved horsepower numbers in many applications. The NST CR-Lite Pulley KIT is compatible with naturally aspirated, turbocharged, or supercharged applications, and is compatible with the OEM belt. No belt change is required when this crank pulley is used. This KIT includes ALL seven pulleys available for the FRS and BRZ. Crank, Alternator, Water Pump, Idlers, and Tensioner. This is the ONLY full KIT available for this engine at this time. Only the highest quality, high rpm, Japanese bearings are used in the NST kit and idler/tensioner pulleys include snap rings for easy service in the future. Each NST Scion FRS / Subaru BRZ Pulley is carefully crafted from 6061-T6 aircraft aluminum, tested and balanced to high tolerances. Every NST pulley is hard anodized for exceptional durability and is a great item for use at the track or on the street. Standard Color: Red. Please email us for info on custom colors. Posted on July 23, 2015, in Motorsports, NonStopTuning, NonStopTuning Products. Bookmark the permalink. Comments Off on NonStopTuning Offers THE Most Complete Pulley Kit For The Scion FRS & Subaru BRZ.